On August 29 at 6:55 PM, we will be performing the National Anthem at the Phillies game! Come out to hear us sing and enjoy the game. Tickets are $20 and a portion will benefit the chorus. You can purchase your tickets from any Jersey Sound member, or visit our event page to purchase tickets through PayPal. Each year, Jersey Sound presents the Sweet Adeline of the Year Award to a member who has gone above and beyond in dedication and service to the chorus. This year's recipient is Julie Sinkoff. She serves on our Management Team as Communications Coordinator, writes our weekly newsletter, designs and prints all of our documents and signs, and helps to administer our social media sites. She motivates us as a member of the Incentive Team and is involved in countless other ways. Julie is a treasured member of Jersey Sound and very deserving of this honor! We have been invited to perform as guests on the Rittenhouse Sound Spring Show on Tuesday, May 29th at 7:30 PM at the Trinity Center for Urban Life, 2212 Spruce Street, Philadelphia. Quartets from both choruses will also be featured. Admission is free and there will be refreshments available for purchase. Visit the Rittenhouse Sound web page for more information. Jersey Sound is thrilled to have won two medals at our regional competition as the third place Division AA chorus and fourth place overall. We also achieved the highest score in our history! Thank you to all of our family and friends who have supported us this year! Jersey Sound's Annual Show, Cool Yule!, scheduled for December 9 has been cancelled due to inclement weather. Jersey Sound was captured by Action News while caroling in Haddonfield, NJ on November 25! Do you love Boscov's? Do you love shopping deals? Do you love the Jersey Sound Chorus? On October 17, 2017, Boscov stores are holding their 20th Anniversary Friends Helping Friends Fundraiser. For $5 you can recieve a special pass for 25% off many items! Contact any member of Jersey Sound to purchase your shopping pass, or email [email protected]. 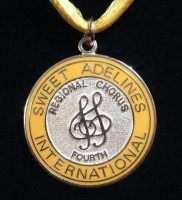 Jersey Sound was awarded fourth place medals at the Sweet Adelines International Region 19 Competition in Hershey, Pennsylvania on April 8. Jersey Sound Chorus of Sweet Adelines International, Inc.